Health Care District trauma nurse David Summers narrates. 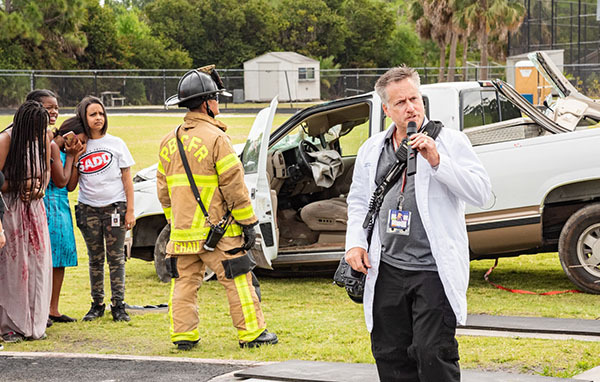 The week before students at Royal Palm Beach High School celebrate their senior prom, the Health Care District of Palm Beach County’s trauma agency and community partners staged a dramatic lesson on teen driving safety. About 500 seniors at Royal Palm Beach High School learned about the potentially deadly consequences of drunk driving, distracted driving and speeding at a crash reenactment on the high school’s football field last week. Members of the school’s Students Against Destructive Decisions (SADD) club participated in the staged two-car collision, and the Health Care District’s Trauma Hawk helicopter landed on the field to simulate transport of a mock patient. This was the third of four “Shattered Dreams” presentations this year. 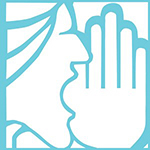 Motor vehicle crashes are the leading cause of death among 15-to-20-year-olds, according to the National Center for Health Statistics. In 2018, 2,673 teen drivers were involved in a crash in Palm Beach County with more than seven crashes a day by teenagers. The “Shattered Dreams” school presentations illustrate how poor decision-making, along with the use of smart phones while driving, can end in injury, death, criminal records and civil charges. Event partners that donated their time, expertise and/or equipment to facilitate the event included: the School District of Palm Beach County, Royal Palm Beach High School’s administration and school police, Royal Palm Beach High School’s Students Against Destructive Decisions (SADD) club, St. Mary’s Trauma Center, the Health Care District’s Trauma Agency and Trauma Hawk Aeromedical Program, Palm Beach County Fire-Rescue, the Palm Beach County Sheriff’s Office, Sisters Towing, LKQ Salvage and Palms West Funeral Home.